This is one of my favourite sites to visit. Sonnja from Netherlands started a project "Beertje Zonn" where she makes pretty cute bears for Aids and orphan children in 3rd world countries. 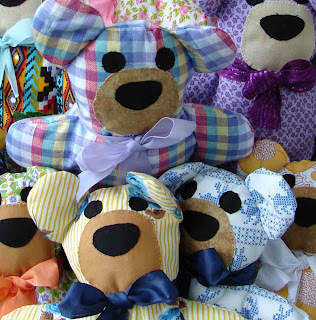 Till date she has made 708 bears. On her blog you can see frequent updates on the bears she makes and the mails she gets from pple worldwide to support her cause. The responses she gets is amazing and its a wonderful cause. Read more about it at http://www.sonnja.web-log.nl/ . If you want to be part of it, email her! Below are pictures of some of the adorable bears she makes.